Small close-set farms with limestone farmhouses and outbuildings with a number of small nucleated settlements, in landscape of irregular small to medium-sized fields, on western edge of vale. The character area principally falls within the ancient ecclesiastical parishes of Llanbedr Dyffryn Clwyd, Llanrhudd, and Llanfair Dyffryn Clwyd, and partly within the commotes of Dogfeilyn and Llannerch in the ancient cantref of Dyffryn Clwyd, which became the lordship of Ruthin following the Edwardian conquest. It covers the upper part of Bathafarn medieval hunting park sold to the Thelwalls before 1592, although before this the area enclosed by the part is said to have included a number of tenements, the other parts of the park being included in character areas to the south and west. The park is said to have included some arable and meadow land which may have lain in the lower-lying area of the park. The eastern gate, one of only two gates into the park, is said to have fallen within the area. Sloping ground on the western side of the vale, between about 35-155m OD, extending from the hill land on the west to the western edge of the flood plain of the Clywedog on the east. The western edge of the vale is broken into segments by a number of deep valleys cut by fast-flowing streams running eastwards to join the Clywedog, including the Nant-mawr running through Pentre-Llanrhaeadr. Fairly close-set farms, smaller farms often 400-500m apart, with 18th-century limestone farmhouse and outbuildings at Wern-neidr, 18th- to early 19th-century farmhouses, limestone and occasional brick outbuildings and rendered farmhouses at Bron-dyffryn, Ty-coch, Pen-bryn-llwyn and Pentre Farm, with limestone farmhouses at Llwyn Bank, Llwyn-mawr, Llwyn-celyn, some of the smaller farmhouses now converted to private houses. Glanaber farm with 19th-century brick farmhouse on top of foundations of 17th/18th-century stone farmhouse. Small nucleated village of Llanrhaeadr, with 18th-century almshouses, former smithy, and a number of 18th/19th-century limestone houses around the medieval limestone church, late 19th-century school and school-house, the growth of the settlement in the post-medieval period due partly to the small limestone quarries and limekilns in the hills just to the west of the village. Post-medieval nucleated settlement at Pentre-Llanrhaeadr along the main road between Ruthin and Denbigh, built up around former mill on the Nant-mawr stream, revetted in stone where it runs through the village, with a small 19th-century core with late 19th-century chapel, and later 20th-century expansion to the west of the main road. Scattering of isolated 19th-20th-century houses south of Pentre-Llanrhaeadr and small modern nucleated settlement of bungalows around Llwyn-celyn farm to the north of Llanrhaeadr. 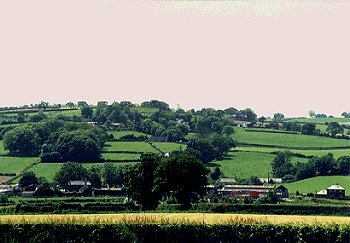 Clustered, irregular, small to medium-sized fields with hawthorn, oak, and holly hedges and scattered mature oaks with traces of ridge and furrow cultivation just to the north of Llanrhaeadr, and lynchets below hedges on a number of the steeper slopes. Some modern hedge replanting. Present-day land-use principally pasture, with some fodder crops. Deciduous woodland areas on steeper slopes and in steep-sided valleys to west and south of Llanrhaeadr, including Coed Mawr and Coed Nant-mawr, both of which are classed as ancient semi-natural woodland, some replanted in the case of Coed Mawr. The area is bisected by the main road along the western side of the vale, the A525 between Denbigh and Ruthin. This improved road now bypasses the village of Llanrhaeadr, the road having a number of lay-bys created where it has been straightened. Access to the farms and villages on the hill land to the western side of the vale is by a network of narrow and winding lanes running steeply uphill in hollow-ways, together with a number of green lanes and footpaths. A number of tracks and footpaths, some again running in hollow-ways, give access to the damp meadow land bordering the Afon Clywedog on the eastern side of the character area. Ornamental stone bridges, cascading stream and slab-lined pool of Ffynnon Dyfnog's, the holy well of the patron saint of Llanrhaeadr, rising in a cave on the stream 200m to the west of the church. Thomas Pennant in 1773 described the well as being 'inclosed in an angular wall, decorated with small human figures [now missing]; and before is the well for the use of the pious bathers'. Large 16th/17th limestone-built Llanrhaeadr Hall to the east of Llanrhaeadr, the house altered and enlarged in the 18th and 19th centuries, with 18th- and 19th-century outbuildings including barns, laundry, stables and walled garden, and avenue set in extensive parkland on the flat pasture on the western edge of the floodplain of the Afon Clywedog. The parkland is subdivided by iron railings and with stone walling on public road past hall and through Llanrhaeadr village.